THE CALLAHANS OF STRINGYBARK CREEK - Book 2 Griffin Callahan and Olivia Dawson were inseparable. Everyone in town knew it. But when Griff went off to Ag College, Liv told him it was over and fled her family's farm to study law. Griff had never understood her reasons but eventuall... read full description below. THE CALLAHANS OF STRINGYBARK CREEK - Book 2 Griffin Callahan and Olivia Dawson were inseparable. Everyone in town knew it. But when Griff went off to Ag College, Liv told him it was over and fled her family's farm to study law. Griff had never understood her reasons but eventually accepted that first loves don't last. Until now. Currently back on the farm to help her twin brother with the harvest, Liv is the same gorgeous, laughing, hazel-eyed girl he'd always loved. Yet Griff can sense a difference, an uncertainty playing beneath the surface that wasn't there before. Amidst crossed wires, drunken declarations, and families on a mission, will Griff and Liv finally have a second chance? Or will the old saying - If you love someone set them free - become their reality? 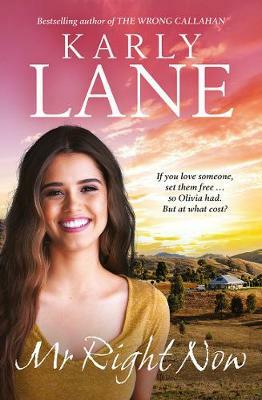 Karly Lane lives on the mid-north coast of New South Wales. Proud mum to four children and wife of one very patient mechanic, she is lucky enough to spend her day doing the two things she loves most - being a mum and writing stories set in beautiful rural Australia. Her bestselling novels include North Star, Morgan's Law, Bridie's Choice, Poppy's Dilemma, Gemma's Bluff, Tallowood Bound, Second Chance Town, Third Time Lucky, If Wishes Were Horses, Six Ways to Sunday, Someone Like You and The Wrong Callahan, the first in the Callahans of Stringybark Creek series. Mr Right Now is her thirteenth novel.